A new generation of buyers can go high-tech with the new Mercedes-Benz 2014 CLA250 Coupe that has just begun arriving in U.S. showrooms. The all-new 2014 Mercedes CLA-Class Coupe is beginning to arrive in dealers nationwide and comes with the kind of high-tech features that a new generation of buyers are looking for. 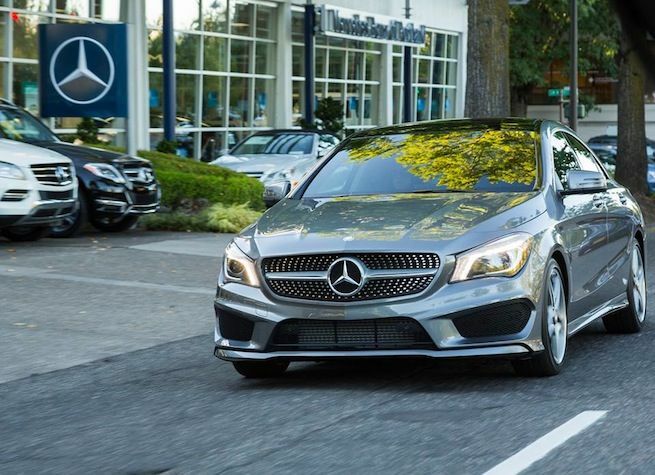 Mercedes-Benz has hit the mark and designed the new 2014 CLA-Class for a new generation of buyers who never purchased a Mercedes vehicle before. And they are giving them the high-tech features they want. Most older buyers wouldn’t even pay attention to what Mercedes-Benz is offering in the way of these high-tech offerings. But this millennial generation that Mercedes is attracting, grew up with this technology and it’s a natural thing to want it in their cars. It starts with keeping a new generation connected to the iPhone. Younger buyers don’t use their phones as a phone, but for they use it for everything else. This is a smart move by Mercedes as they look to attract this highly connected generation. It starts with the Drive Kit Plus for the iPhone, together with the Digital DriveStyle app specially developed by Daimler, makes it possible to seamlessly integrate iPhones 4 and 4S in the CLA. Highlights include Siri voice control, the advanced navigation solution from Garmin with internet-based real-time traffic information, Google online POI search including Street View and 3D map view as well as the real-time location sharing system Glympse. Additional functions come in the guise of Facebook, Twitter and AUPEO! It also comes with Personal Radio, as well as internet radio for national and international stations. Mercedes calls the new technology mbrace, and buyers can choose three different packages and get useful features like traffic and weather alerts, roadside assistance, local fuel prices and movie theater showtimes. The three packages can be purchased for a monthly or yearly fee and they come on the new CLA-Class with trial subscriptions included. mbrace PLUS costs $20.00 and is billed monthly (3-month trial included). It includes Mercedes-Benz Concierge, Point of Interest Destination Download, Route Assistance, Location-based Traffic, Location-based Weather, Driving Journal, Travel Zones and Speed Alert. mbrace Package is $280.00 per year with a 6-month trial included. It includes mbrace Mobile Application for iPhone or Android, Automatic Collision Notification, SOS/Emergency Call, Roadside Assistance Connection, Stolen Vehicle Location Assistance, Automatic Alarm Notification, Crisis Assist, Safe Ride, Valet Protect (via Mobile App), Send2Benz, Route2Benz, Drive2Friend, Remote Door Lock, Remote Door Unlock, Vehicle Finder (via Mobile App), Remote Horn and Lights (via Mobile App) and Dealer ConnectVehicle Information. Mercedes-Benz Apps is available for $14.00 per month and a 3-month trial included. It includes high-tech features like Internet BrowseGoogle, Local Search with Street View and PanoramioYelp, Facebook, Destination/Route Download, News, Local Traffic Cams (available starting late 2013), Weather (available starting late 2013) Hotel room search and reserve, powered by HRS (available starting late 2013), Local fuel prices (available starting late 2013), Flight/airport status (available starting late 2013), and Movie theater showtimes (available starting late 2013). The all-new 2014 Mercedes-Benz CLA250 has begun arriving in U.S. dealer showrooms and starts at $29,900. Mercedes is attracting a new generation of buyers with its dynamic four-door coupe styling, fuel-efficient aerodynamics and connectivity for a new generation. It looks like a great combination. Buyers can go here, view a video brochure, and build your own dream CLA.